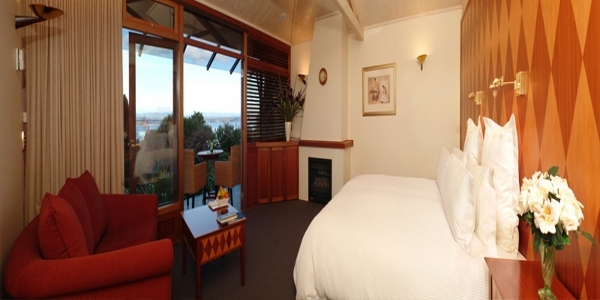 Lake Taupo Lodge’s creation was started 30 years ago by Gary and Shirley when they purchased 10 acres of wild bush in Acacia Bay overlooking Lake Taupo. Both of them are keen gardeners and Gary has a particular love of wildlife so the native bush formed the perfect haven for his love of birds. From there they split it up into 3 lots retaining the 3 and 1/2 acre lodge site for themselves. Having visited Chicago and many parts of the world Gary was impressed with the harmonious and geometric style of Frank Lloyd Wright and was inspired to build in a similar style, embracing the organic and unique features of the natural landscape. A well known NZ architect Gary Dennison was employed to design their new home, which subsequently won a top New Zealand architectural award. Gary and Shirley were involved in the fashion industry they owned and managed their own busy leading fashion label “Formula Fashions” for 30 years, in NZ and Australia. 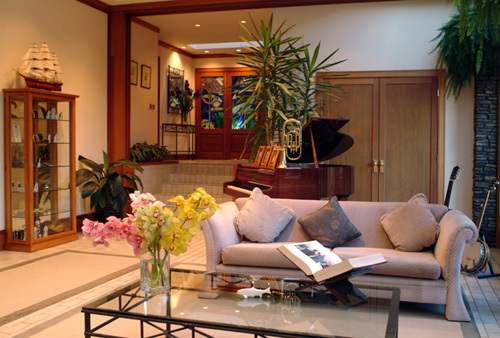 The high life of entertaining required a large venue which influenced the design of the new home hence the easy flowing spacious rooms and accommodation, all perfect for the future concept of turning this lovely home into a beautiful lodge. In 1996 Gary and Shirley took the plunge and turned their three storied 13,000 foot home into what is now Lake Taupo Lodge, and so began the journey. From the breathtaking lake and mountain views to the gorgeous gardens that surround you there is an overwhelming sense of peace and tranquility. 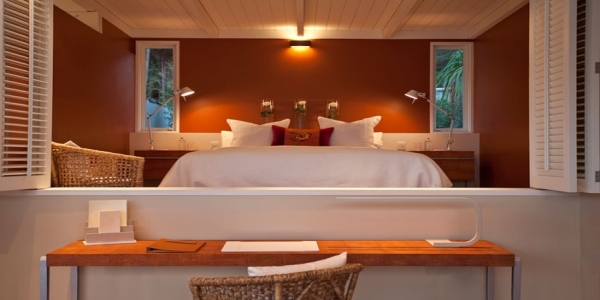 Sink into the soft furnishings in the library in front of the fire or recline on a sun lounger in the seclusion of the gardens where native birds abound. 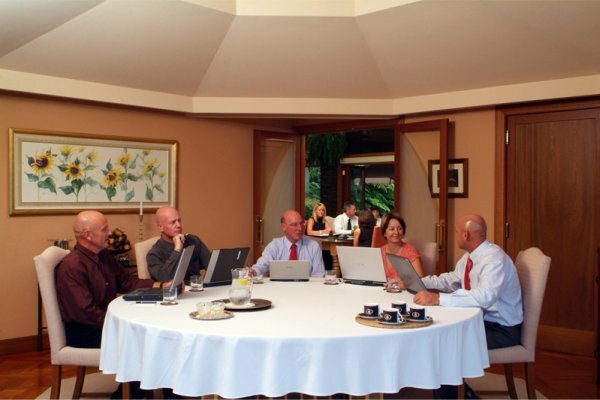 All office functions are available with high speed internet access on the guest computer. 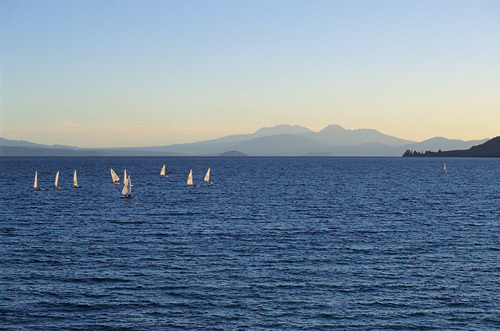 The Taupo region has a wealth of activities that we are very proud to support. 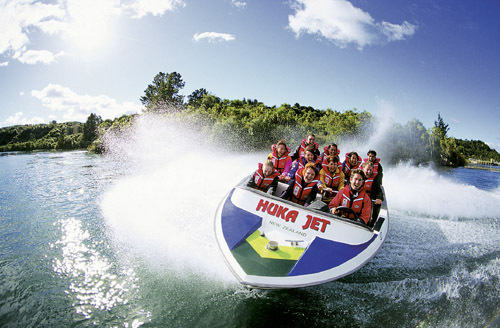 Our focus is for you to have a personalized, unique and memorable experience using the best guides and activities that Taupo has to offer. Please see our activity section for ideas on what to do while you are here, whatever you choose will be great! After a rewarding day exploring the region you can enjoy a therapeutic massage then come through to the lodge for pre dinner drinks. We are fully set up for small VIP Executive conferences with all up to date technology and have had some very successful meetings here. 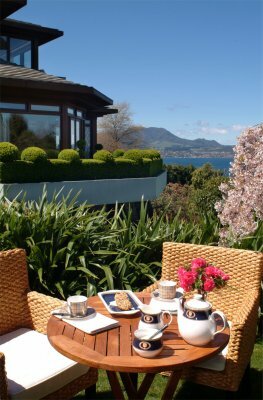 Taupo is ideal for pampering important people that need a retreat from the hectic business world. Wairakei Golf course is only 10 minutes from the lodge. Small weddings, private functions and conferences are available but need to be a minimum of two night’s exclusive use of the lodge. 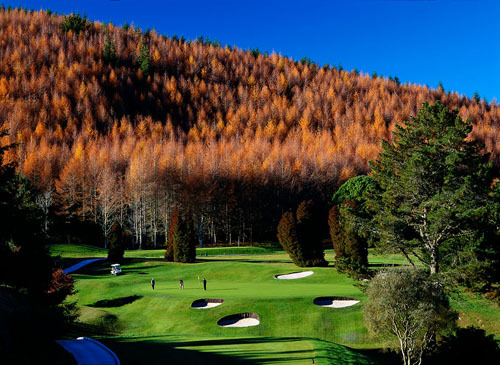 Taupo has two of the most beautifully designed and popular golf courses in the country – Wairakei International Golf Course and the personally designed and endorsed Kinloch Club Jack Nicklaus Signature Golf Course. If you are a golf fanatic these are a must!!. Wairakei International Golf Course – rated by the Prestigious US Golf Digest magazine to be in the top 100 courses in the world outside of the USA in 2005. Set amongst the spectacular scenery of the Lake Taupo region, this course was designed by Commander John Harris, Michael Wolveridge and Peter Thomson with the aim of producing New Zealand’s first internationally recognised golf course. 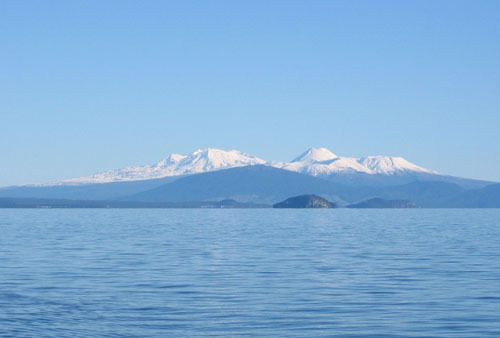 The first trout were liberated into the waters of Lake Taupo, New Zealand’s largest lake, in 1887. They were the Californian Brown Trout and the Californian Rainbow Trout. With few natural predators, an enormous food supply and hundreds of kilometers of prime spawning streams and rivers flowing into the lake, they thrive. Today, with a self sustaining population of Rainbow and Brown Trout, the Taupo region has cemented its name as one of the world’s premier fisheries. Some of these tributaries have difficult access, but don’t let that put you off. If you make the effort there is an excellent chance of catching late and early run rainbows and large browns, and it’s quite likely you could have a whole day of fishing without seeing another angler. The town of Taupo is relaxed and friendly. 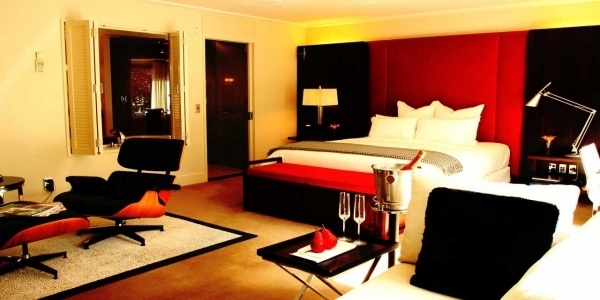 It offers boutique specialty shops, art galleries, and a wide range of restaurants and cafes, both outdoor and indoor. Waitomo Caves – famous for its black water rafting and glow worms. Tongariro National Park – a World Heritage Park and home to three volcanoes and many beautiful hikes, including the Tongariro Crossing, one of the most spectacular one-day hikes in New Zealand. Hawkes Bay – famous for its wine as well as the art deco architecture of Napier and several beautiful beaches. Rotorua – New Zealand’s version of Yellowstone, with active geysers, mud pools, mineral spas and Maori culture. 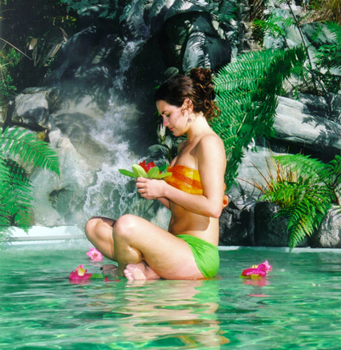 Waimangu – Enjoy the geothermal activity, hot springs, geysers and mud pools. Wai-o-tapu – a truly distinctive and unique experience with the famous ‘Lady Knox Geyser’ that erupts daily at 10:15am. – A thermal wonderland waiting for you. 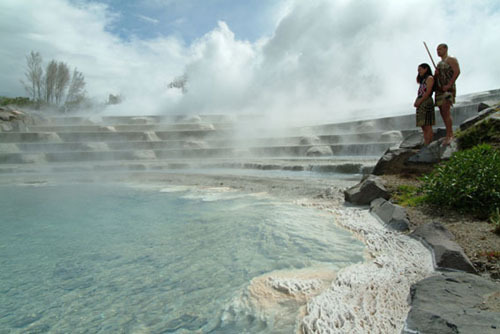 Whakarewarewa / Te Puia – Set amidst a landscape of erupting geothermal activity, hot thermal springs and hot bubbling mud pools is the Living Maori village of Whakarewarewa situated in Rotorua, the heart of the North Island. 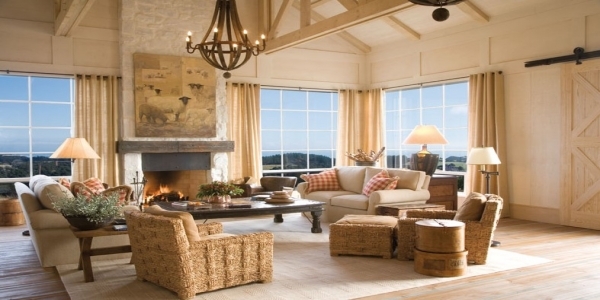 All our suites have private outdoor patio areas with table and chairs where one can listen to the birds and soak up nature’s beauty and the magnificent lake and topiary garden views. The three executive suites “Frank” “Lloyd” and “Wright” have been inspired by the same Frank Lloyd Wright architectural design (hence the original names!). 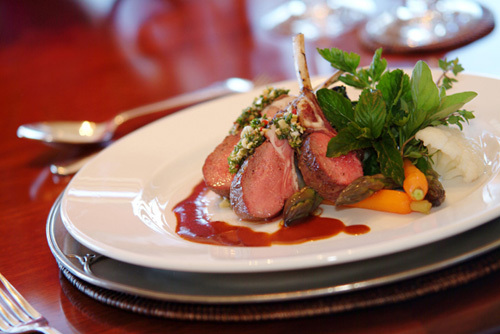 We believe that the dining experience whilst traveling through New Zealand should be a memorable one. 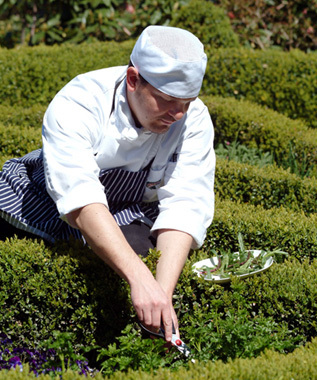 Our two five star chefs focus on the use of fish and game and the finest local and seasonal produce including fresh herbs picked from the Lodge’s organic garden. 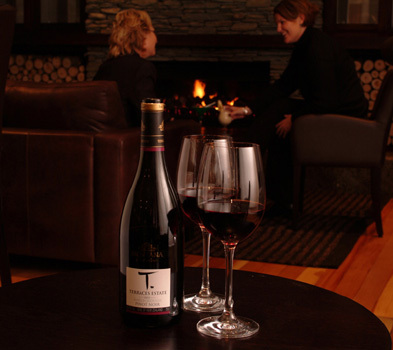 Share an intimate dinner for two in the main lounge with the lights of Taupo twinkling in the distance or share fascinating stories with fellow guests in the main dining room overlooking the beautiful Lake and mountains. As a prelude to dining we have pre dinner drinks and canapes about the bar where there is an infectious conviviality and it is easy to make friends from all over the world. A sumptuous four course dinner follows so if you have any preferences please let us know and the meal will be designed with you in mind. 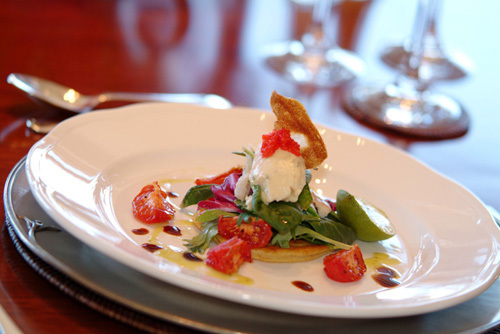 A lavish buffet breakfast awaits you in the morning to prepare you for your days activities ahead. 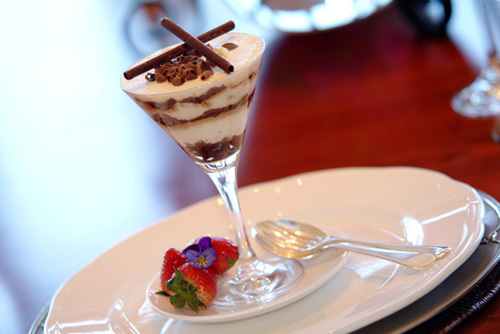 There are a variety of lovely places in Taupo for lunch which we are happy to recommend. We stay in touch with the world in a special way through the perspectives of interesting people who stay overnight with us to share stories, dine, drink and sleep well.